MSG Networks (MSG/FSN New York) announced today a 10-year extension to telecast the NHL's Buffalo Sabres games, in which MSG will own the exclusive local rights to telecast the team's games. The deal will start after the 2006-07 season, and run through the 2016-17 season. In addition, the Sabres will immediately take control of selling all commercial inventory during broadcasts for the upcoming season. "The Buffalo Sabres are a major component of our sports programming, and this decade-long renewal showcases our significant commitment to hockey and to the Western New York community," said Michael Bair, president, MSG media. 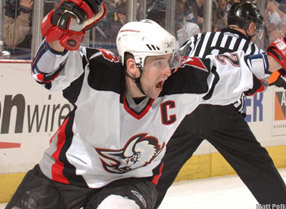 "MSG Networks own hockey in the New York area, and we are thrilled to make this long-term deal with the Sabres." "This past seasons' TV ratings for the Sabres showed a dramatic increase as compared to past years," said B. Thomas Golisano, owner, Buffalo Sabres. "It demonstrated once again the terrific support by our fans in western New York. Our new partner, MSG, quickly grasped the enthusiasm here and wants to be a part of it for a long time." With this new partnership, the Buffalo Sabres will be responsible for selling the commercial inventory for all broadcasts beginning with the 2006-07 season. This component will allow the organization to create long-term deals that will maximize revenue streams in partnerships that already exist with the Buffalo Sabres and within the HSBC Arena. "We are extremely happy to announce this highly competitive, long-term partnership with MSG Networks," said Larry Quinn, managing partner, Buffalo Sabres. "Our close relationship with MSG Networks last year was a dramatic change from past TV deals. Furthermore, we feel this 10-year extension will vastly enhance and expand the level of regional coverage and broadcast expertise that we've always wanted from our television partner." In addition to being home of the Sabres, MSG Networks award-winning programming line-up also boasts the Knicks, Rangers, Islanders, Devils, Liberty, Red Bulls, and over 300 live college football and basketball games. In addition, the network will launch new original programming this fall, including the 10-part documentary "The 50 Greatest Moments at Madison Square Garden." MSG Networks (MSG and FSN New York), an industry leader in production and content development, is the nation's longest-running regional sports network broadcasting over 500 professional and collegiate sporting events a year with a full slate of Emmy Award-winning programs. The first regional sports network to produce games in HDTV and to offer its own VOD and podcast service, MSG is part of Madison Square Garden L.P. Cablevision Systems Corporation owns Madison Square Garden, L.P., which includes the New York Knicks (NBA); the New York Rangers (NHL); the New York Liberty (WNBA); MSG Entertainment; the Hartford Wolf Pack (American Hockey League), and the Madison Square Garden arena complex, located in the heart of the New York metropolitan area.